In central Nairobi, crackdowns on illegal street trading by officers from the local authorities are a daily occurrence. Based on an ethnographic study of encounters between street traders and officers during crackdown operations in and around the Nairobi CBD, this article argues that crackdowns work as a platform for exchanges and thereby for the formation of social relationships. It explores how such relationships are formed and maintained during crackdowns, and how a range of urban actors has interests invested in them. The article contributes to regional literature on street trading by proposing a view of urban governance as emerging through everyday interactions and relations between urban actors. Furthermore, the article contributes to scholarship on relational urban governance by exemplifying how anthropological notions of exchange provide an analytical avenue through which such everyday interactions and relations can be explored. 1It is Saturday afternoon and the street has transformed into a marketplace. Lines of impatient pedestrians maneuver through the narrow passage between neatly arranged goods laid out on white canvas bags on the pavement, dodging street traders who hold out pairs of jeans, tops and handbags in their direction. Then some shouting from a distance, and all at once hundreds of traders grip the corners of canvas bags and fling the white bundles over their shoulders. Nairobi City County Inspectorate officers have been spotted heading in this direction. There is an outburst of energy as the street becomes a frenzy of running and pushing. A few seconds later you only see confused pedestrians and, close to where the white City County van is now parked, a few abandoned goods. The officers pick up the bundles of shoes and clothes and take them back to the van. 2“My shoes were taken yesterday,” a young trader called Pete tells me the next day. “But the officer was a good one. He told some of the guys [young men employed in nearby shops] to call me. I came to the van. 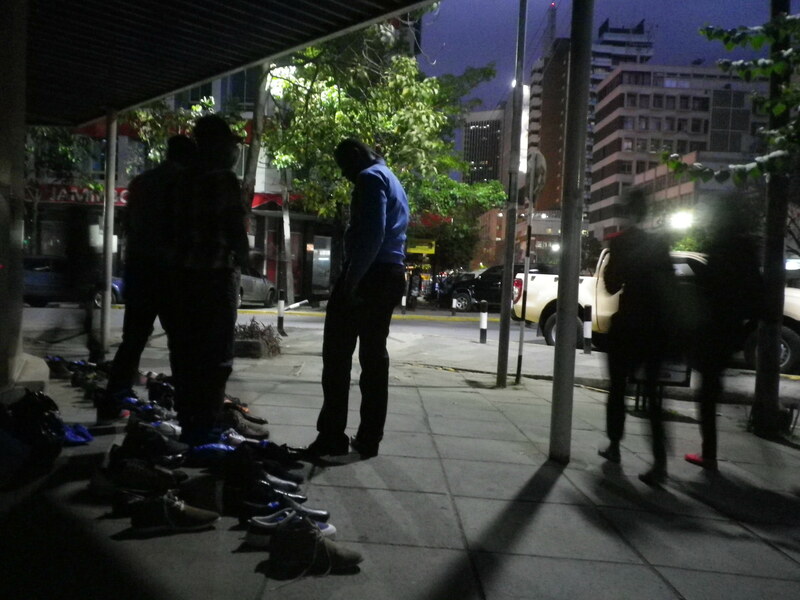 He just took 500 [Kenyan Shillings] and gave me back my things.” If the officer had not initiated the deal right then and there, Pete explained, he would have had to go and pay a heavy fine at City Hall before collecting his shoes at the City County depot. 3Crackdowns on illegal street trading by Inspectorate officers from the County Government are a daily occurrence in central parts of Nairobi. In regional literature on urban planning and street trade (Kinyanjui 2010, 2014, Morange 2015, Médard 2010, Kamunyori 2007, Mitullah 2010), crackdowns are generally understood as more or less failed attempts by local authorities to rid the city of street traders in order to live up to an ideal of the clean and modern city. However, the arrangement between Pete and the “good” officer in the example above indicates that there is more going on during crackdown operations than simply an attempt to remove street traders. As I will go on to show in this article, a range of mutual agreements and exchanges take place in relation to crackdowns, involving street traders, Inspectorate officers and a number of other actors. Although street trading in Nairobi certainly continues to be treated as an affront to urban planning and efforts to build a “world-class city-region” (see Myers 2014), it seems that crackdowns as a policing practice work to a wider range of ends than simply the clearing of city streets. 4In the article, I suggest that crackdowns, arrests of street traders and subsequent bribe payments in return for the traders’ release or for retrieving confiscated goods, form a particular type of exchange practice involving street traders and inspectorate officers. Drawing on classical notions of gift exchange from economic anthropology (Mauss 1950 ), I suggest that this exchange practice provides a platform for the formation of relationships between officers and traders. The central questions of the article revolve around how such relationships are formed and reproduced during crackdowns, what range of actors have a stake in the exchange practice, and how this allows us to explore questions of urban governance in relation to street trading. 5The contributions of the article are two-fold. Firstly, I seek to start a discussion within regional scholarship about how we understand policing practices in relation to street trading and, in extension of this, where we turn our gaze in order to explore urban governance in relation to street trading. I suggest that we look beyond exclusionary visions of the city drawn up by city planners and explore, instead, the projects and interests at play in everyday encounters between street traders and local officers. In short, I suggest that regional scholarship can gain from a view of urban governance as relational. In suggesting that we take an interest in street-level relations and interactions in order to understand the workings of urban governance, I draw on a body of literature, which locates questions about the constitution of the state in studies of everyday practices and relationships between people. This includes discussions about how forms of political, regulatory and disciplinary authority are shaped through everyday practices in spaces, which are ordinarily understood to be at the margins of the nation-state (see Das & Poole 2004, Jeganathan 2004, Roitman 2004). In relation to urban governance specifically, such an approach can be found in the work of Kihato (2011a, 2011b, 2013) as well as that of Landau and Manson (2008). Here, urban governance is seen as “co-constructed” in interactions between different urban actors (Kihato 2011b: 349), and interactions in urban settings are understood as engendering “challenges to and reconfigurations” of sovereignty (Landau and Manson 2008: 315). The second contribution of the article is theoretical, and it is directed at this scholarship on relational urban governance. As exemplified in the article, I suggest that a notion of exchange as the basis for social relationships from economic anthropology provides a fruitful analytical avenue through which to explore such everyday interactions between urban actors. 6The article is based on ethnographic fieldwork conducted among street traders in five locations within the Nairobi Central Business District as well as the nearby Ngara area. The fieldwork took place during the months of April, August, September and October 2016, and data was generated mainly through participant observation and informal conversations with street traders at their places of work. The research participants numbered 30 street traders with whom I engaged regularly and a larger number to whom I related more peripherally. The comments and explanations from street traders presented here are mostly related to specific events observed during fieldwork, rather than answering general questions about the nature of street trade or policing. This reflects the method of data collection, where knowledge about the research themes was built by exploring the significance of particular events in the eyes of the research participants. 7The article is structured as follows: I begin by mapping the ethnographic field in which the research was conducted, including a contextualization of the Nairobi Central Business District as a place for street trading and a portrayal of the street traders with whom I engaged. Next, I situate the arguments of this article in relation to literature on street trading in Nairobi. In the subsequent analytical sections, I first argue that crackdowns can be understood as an exchange practice, and I explore how they provide a platform for the formation of relationships between street traders and Inspectorate officers. I then explore how other urban actors besides street traders and Inspectorate officers have a stake in the exchanges relating to crackdowns. I conclude by drawing up the contributions of the article to regional and thematic literature. 8Before starting on the argument of the article, it is worth noting that the situations and persons described here are not typical of all street trading in Nairobi. Pete, the ‘good’ officer, and their colleagues on both sides are all working in a relatively tightly policed area within Nairobi’s Central Business District. “Money falls like rain in the CBD,” is a phrase I heard several times among the street traders I spoke to during my fieldwork. If you manage to put down your goods for just a few hours in the CBD, you can make a considerable amount of money compared to what you would be able to make in a market or on a street in a more peripheral area. At the same time, Nairobi authorities are particularly focused on carrying out crackdowns in and around the CBD. “If you work there, you will always be running,” is the phrase that most often accompanies the one about money. 9The concern with keeping the CBD area clean and modern can be traced back to the colonial governance of Nairobi when hawking was legal and regulated in most parts of the city with only exception of being strictly prohibited in the ‘Commercial’ area, more or less corresponding to the current CBD (Nairobi Municipality 1942). Today, it remains a contested area in terms of street trading. Morange (2015) talks about the longstanding ‘fight’ of street traders to access the CBD against the exclusionary urban governance of the Nairobi local authorities. 10Being extraordinarily attractive for its opportunities to make money and at the same time an extraordinarily risky place to attempt street trading because of the frequency of crackdowns, the CBD is an atypical case of street trading in Nairobi. With case study terminology, it can be understood as an “extreme case” which is atypical of the normal, but which holds analytical potential in that it reveals particular dynamics more clearly than other cases (Flyvbjerg 2005: 229). Since the interest of this article is relationships between street traders and inspectorate officers as they are formed and shaped during crackdowns, studying the CBD allows for a close study of spaces where encounters between them are particularly frequent. The final aim is to discuss our understanding of urban governance in relation to street trading. In this way, the examples drawn upon from the CBD serve as social situations, which can be analyzed in their specificity to reveal dynamics on a larger societal scale (Gluckman 1940: 29-30). 11The street traders quoted here are between 20 and 40 years of age. Many have told me that street trading became a default occupation for them when they found themselves unable to get a formal job in the increasingly informalized Kenyan labor market. By the mid-2000s, it was estimated that half of Nairobi’s working population was employed in the “informal sector”, and that 20-25 percent of these were street traders (Kamunyori 2007: 9). According to the research participants, street trading does bring in a reasonably good level of income compared to other activities available to them such as taking a job in a supermarket or in one of the small shops in the city center. 12Scholarship on street trading in Nairobi describes how shifting stances on behalf of urban authorities have led to oscillation between relative tolerance of street trading and periods marked by “clean-up” operations where traders are driven off the city’s streets. Morange (2015: 249-253) traces how “imaginaries” of the city have informed urban planning from the 1948 Nairobi Master Plan to the Nairobi Metro 2030 Vision, and describes how street traders have been alternatively tolerated and criminalized because of tensions between the ideal of a modernistic developed city, on the one hand, and hopes pinned on informal trading as a “poverty eradication formula” on the other. Similarly, Kamunyori (2007) argues that there is an ongoing “tension” between the “desired modernization” of Nairobi and what is perceives as an “’un-modern’ activity of street vending” (Kamunyori 2007: 3). 13In regional literature, crackdowns are generally understood as indicative of a hostile attitude towards informal economic activities on behalf of urban authorities. Based on an analysis of archival material relating to the regulation of street trading since independence, Kinyanjui (2014) associates evictions of street traders from the city center with an image of them as “outsiders” in the city. Mitullah (2010: 187) states that “For decades, many African governments believed that the informal economy could be formalized by deploying punitive control measures.” However, she continues, human rights abuse by governments became an occasion for street traders to form social movements and push for improved rights (Mitullah 2010: 199). Other studies emphasize how shifting constellations within Nairobi’s local authorities over the years have led to different styles of governing street traders. For example, Médard (2010: 49-50) describes how in the early 1990s there were a series of crackdowns on street traders, but that when a new municipal team was elected in 1993 which had disagreements with the provincial administration, crackdowns ceased for a period of four years. 14Common to all these studies is that street trade is understood to be undesirable to authorities, and that crackdowns are seen as attempts to get rid of the traders. If the crackdowns do not succeed in permanently removing traders from the streets, this is ascribed in part to the traders’ success in pushing for their right to the city, including alliances with local politicians, in part to a recognition on behalf of authorities that street trade is a necessary evil uphold the livelihoods of the poor, and in part to local authorities being concerned for their image. However, as I will go on to show, crackdowns themselves can be seen to serve other purposes than the removal of traders. 15Njeri and I were walking in central Nairobi. Njeri sells handkerchiefs and hairbands on one of the main streets, but on that afternoon she was taking a break from her work because she had received a phone call telling her that City County Inspectorate officers were in the area. Her bundle of goods was hidden in a nearby shop where she knows the security guard. When we crossed Tom Mboya Street in the slow-moving rush hour traffic, the white City County van with bars on its windows passed right in front of us at snail pace. Behind the bars, we could make out the backs of around ten street traders who had recently been arrested. A hand reached out through the bars, waving us closer to the van. “Wait one moment,” Njeri told me and walked up to exchange some words with the owner of the hand. All the while, the officers in the front of the van either did not notice or decided to ignore what was going on. A cell phone was pushed through the bars with some difficulty, and Njeri caught it and walked back to me saying, “We need to go withdraw some money from Mpesa, let’s go.” We went with the cellphone to withdraw the money for Njeri’s colleague so she could pay her way out of the van. 16Street trading is strictly prohibited in the CBD under the City of Nairobi ‘hawkers’ amendment bylaws of 2007. According to the bylaws, licensing is compulsory for any street businesses, and licenses are restricted to newspaper vendors and shoes shiners. Unlicensed vendors face jail time of up to 6 months, and their goods may be seized to be returned to them in exchange for a fine (Morange 2015: 252-3). The County Government’s Inspectorate Department is responsible for patrolling the streets for unlicensed vendors and for taking them to the City Court where they will be formally charged and fined, if found guilty. 17It is common knowledge among street traders, though, that once you are caught by the officers and pushed inside the characteristic white van, you can get yourself out again before the van reaches the court by paying between 500 and 2000 Shillings, depending on what the officers decide to charge you. If you do not have the money on you right then and there, you can call your friends to lend it to you, or you can do what Njeri’s colleague did, sending someone else to withdraw money and bring it back to you, pushing the notes through the window bars. In early 2016, a group of anonymous public interest researchers in collaboration with investigative journalists published numbers on what they estimated to be the extent of bribe collection from street traders in Nairobi. According to their figures, street traders in Nairobi paid 80 million Shillings every month in illegal bribes to County officers inside City County vans (Huyo 2016). Even though the figure is likely to have changed in the meantime, it gives an impression of the extent of bribe-payments. 19There are surely several reasons why Nairobi City County authorities have so far refrained from offering legal solutions to the majority of street traders, and I do not want to suggest an over-simplified explanation where profits from bribes is the only factor at play. Regardless of the reasons, however, it seems to me that the continued criminalization of street trade does promote a particular type of economy based on the routine practices of arrests followed by bribe giving in exchange for premature release. 20In order to explore what goes on inside the City County Inspectorate van, I propose that we see crackdowns as an exchange practice in the classical anthropological sense (Mauss 1990). This perspective does away with the generally accepted idea that crackdowns have the sole function of removing street traders. Instead, central elements of crackdowns such as arrests, incarceration in the City County van and the immediate prospect of being placed in front of a judge at City Court can be seen as circumstances which come together in order to make the premature release from vans a value worth exchanging for street traders. After all, traders do part with a considerable proportion of their earnings in order to get out of City County vans on a regular basis. 21Seeing crackdowns as gift exchange, however, immediately brings about some uneasiness. Does this approach imply that officers and traders somehow participate in crackdowns as ‘equal’ exchange partners? As Annette Weiner (1992) and others have pointed out, classical notions of ‘reciprocity’ developed by scholars such as Mauss in the 1920s did not leave room for considering hierarchies and power dynamics in exchange relations (Weiner 1992: 31-33). When looking at crackdowns, it seems more appropriate to see exchanges in the sense proposed by Weiner, namely as strategies and calculative moves by participants from different positions of wealth and influence (Weiner 1992: 141). 22Having considered this, the exchange perspective does have the advantage of bringing attention to the ways in which crackdowns, rather than being isolated incidents of extraction, provide a platform for the continuous reproduction of relationships between street traders and officers (Mauss 1990: 25). In the following section, I will explore how such relationships are formed and what types of power dynamics they are characterized by. 23When the phone call comes informing them that officers are in the area, street traders pack up and hide their goods. Afterwards there is nothing to do but wait until the officers have gone to a different part of town. During one of those stints of waiting, I was sitting with a small group of traders by the side of the road, killing time, when a group of middle-aged men in casual clothes walked up to us. “You have a visitor today. How are you doing?” The men greeted me and made remarks to the traders who responded, unenthusiastically. After the men had left, the traders told me that these were the City County officers. “How did you know that it was them?” I asked. “We know them, all of them. By their faces,” Mama Princess explained, meaning that the traders recognize officers based on their physical appearance, even if they do not know their names. 24The traders started commenting on one of the officers, asking me if I had noticed him. “That one is a Kalenjin, he can run!” Mama Princess said, and illustrated by moving her arms like a runner. “He has catched [sic] so many of us.” It was not the first time street traders had described individual officers to me by mentioning a characteristic or a quality about them. “Do you see that man, with a blue cap? He is an officer. That one is bad! He is very brutal. Once he arrested me and kept me in the cell the whole weekend.” Or: “Did you see that one, in the grey shirt? He is a good one. He understands if you tell him that you do not have money.” Not all officers are bad, I was told several times. Some of them you can reason with. If you tell them that you have not sold anything the whole day, they can let you go for a smaller amount of money. 25It seems that street traders get to know both “good” and “bad” officers in situations when they are arrested, and where they negotiate with officers to pay for their release. In Mauss’ sense, then, practices of exchange between traders and officers establish and reproduce relationships between them, whether friendly or hostile. Every relationship between a trader and an officer is marked by a new set of power dynamics. Traders can even have relative power over officers if they are politically connected and if they are able to charge officers in court, as there have been a few examples of recently. In this way, suggesting that crackdowns facilitate exchange relationships is not meant to imply that officers and traders are equal exchange partners in some benevolent cultural practice. Rather, I would like to argue that crackdowns in Nairobi, rather than simply being attempts to remove street traders, provide a platform for the establishment and reproduction of policing relations marked by power and hierarchies. In the following section, I will go on to consider another set of actors with interests invested in crackdowns. 28Other traders also described to me how once there is a sense that the number of street traders has reached a critical mass, the authorities are compelled to act on it. Martin, like other traders I have spoken to, distinguishes between “junior” officers with whom street traders engage on a daily basis and “senior” officers who are the ones leading operations. This could give the impression that corrupt practices are limited to relations between street traders and junior, street-level officers, while senior officers genuinely interested in policing the city streets from time to time initiate tougher types of crackdowns. However, as investigate journalists have alleged in a recently published TV documentary, there are indications that the day-to-day collection of bribes is orchestrated from a higher level within City Hall, and that street-level officers are required by their superiors to hand in a certain amount of illegally collected bribes every day (Africa Uncensored 2016). 29Whether the same senior level officers who order operations against street traders in Nairobi are also benefitting from the day-to-day collection of bribes is not something I would be able to conclusively prove for the purposes of this article. However, if we accept the likelihood that collection of money from street traders does not stop at the level of junior, street-level officers, it does seem that various officials have a complex set of interests invested in crackdowns on street trading. In this way, the continued presence of street traders cannot be ascribed solely to the traders’ success in resisting power, nor to the inefficiency of local government. Continuing within the exchange framework, we can say that senior level officials participate in the exchanges enabled by crackdowns, balancing a concern for the visibility of street traders with an interest in the collection of money from them. 30Up until now, I have been describing a seemingly fixed set of roles and power relations between street traders, street-level Inspectorate officers and their superiors. However, as I will show in the next section, this arrangement of alliances is thrown up in the air every five years when electoral candidates take an interest in street traders as potential vote banks. 31“These days we are selling tax free,” Mary told me one day, with a big grin. She was referring to the fact that the visits by City County officers had become less frequent. “The [election] campaign season has started. They want our votes. The next few months we will be very comfortable here. And then the politicians will come here and try to sweet-talk us.” General elections in Kenya are set to be held in August 2017, less than a year from the time I talked to Mary. Most of the street traders I have talked to throughout August, September and October 2016 have commented that harassment by the authorities is becoming less frequent of late, since ‘campaign season has started’ and ‘we are closer to elections’. It is common knowledge in Nairobi that once it gets closer to election time, city dwellers will experience a mushrooming of street traders in places all over town that were previously very strictly policed. 33Martin was not the only street trader I talked to who expressed disillusionment with the process of backing political candidates. A consensus seemed to be that while enjoying the decrease in policing in the months leading up to elections, it was not wise to expect much from politicians once elections were over. “After elections we will be back to running, like before,” as Mary put it. 34It seems that street traders become a matter of concern to politicians every five years, and that their renewed political significance during election times is accompanied by a decrease in crackdowns. In this way, electoral candidates make up yet another set of urban actors with an interest invested in the practice of crackdowns. While politicians seek to gain electoral support out of a management of crackdowns, their interests can still be understood within an exchange framework as extending a gift to street traders and expecting something in return. In this case, votes and not money are exchanged for the street traders’ chance to work. 35I have shown that crackdowns on street traders in central Nairobi enable different types of exchange practices between officers and traders. Exchanges can be initiated in order for the street trader to retrieve confiscated goods, or to attain release from the inspectorate van before it reaches City Court. They can also take the form or regular payments of ‘returns’ on order for the traders to work undisturbed. Employing Mauss’ notion of exchange as the basis of social relations, I argued that crackdowns in this way provide a platform for the formation of relationships between traders and officers. These relationships should not be understood as benevolent or equal, but rather as marked by power differentials, individual interests and hierarchies. Furthermore, I have shown that the relations between street traders and ground level officers cannot be understood in isolation, but that we need to consider the involvement of senior level officers and of politically elected representatives. These interfere in the exchange practices enabled by crackdowns based on their own sets of interests related to the visibility of street traders on Nairobi’s pavements, and to the seasonally arising need for electoral support. 36What are the implications of understanding crackdowns in this way? Firstly, the view proposed in this article challenges our understanding of how policing of street trade in Nairobi relates to modes of governing street trading and, in extension of this, how we conceive of the position of street traders on the city’s pavements. In regional scholarship, there is a tendency to focus on the ambitions of urban planners and administrators for a clean and modern city. While this approach leads us to an interpretation of crackdowns as attempted purifying exercises, an exploration of everyday encounters between street traders and officers during crackdowns instead indicates various forms of interests and investments by a range of actors. In the article, I have suggested that street traders do not remain in the streets simply because they resist power or because urban governance is inefficient, but that their continued presence reflects different types of gain for various actors facilitated through social relations. In short, I propose that regional literature on street trading can benefit from a notion of urban governance as relational. 37Secondly, the approach in this article exemplifies an analytical avenue through which to conceive of urban governance as relational. Contributing to scholarship, which sees urban governance as co-constructed in everyday engagements between urban actors, I propose that anthropological notions of exchange as the basis of social relationships allow us to explore how various urban actors have interests invested in a social practice. The exchange perspective allows for an analytical understanding of how such different urban actors are mutually engaged in the practice of crackdowns without necessarily sharing mutual interests. Africa Uncensored. 2016. Kanjo Kingdom Part 4. Standardmedia.co.ke, www.standardmedia.co.ke/ktnnews/video/watch/2000106983/-kanjo-kingdom-part-4-tracking-corrupt-deals-by-city-askaris (Retrieved October 30, 2016). Das V, Poole D. 2004. State and its margins: comparative ethnographies, in Das V, Poole D (eds.) Anthropology in the Margins of the State. Oxford, James Currey: 3-34. Flyvbjerg B. 2006. Five misunderstandings about case study research. Qualitative Inquiry 12(2): 219-245. Gluckman, M. 1940. Analysis of a social situation in modern Zululand. Bantu Studies 14: 1-30. Huyo. 2016. The problem. Huyo.online, www.huyo.online/the-problem/ (Retrieved October 30, 2016). Jeganathan P. 2004. Checkpoint: Anthropology, identity and the state, in Das V, Poole D (eds.) Anthropology in the Margins of the State. Oxford, James Currey: 67-80. Kamunyori SW. 2007. A Growing Space for Dialogue: The Case of Street Vending in Nairobi’s Central Business District. Cambridge, Massachusetts Institute of Technology, unpublished MA thesis. Kihato C. 2013. Migrant Women of Johannesburg: Everyday Life in an In-Between City. Berlin, Springer. Kihato C. 2011a. ‘Here I am nobody’: rethinking urban governance, sovereignty and power, in Edjabe N, Pieterse E. (eds) African Cities Reader II. Mobilities and Fixtures. Vlaeberg, Chimurenga/African Centre for Cities: 70-77. Kihato C. 2011b. The city from its margins: rethinking urban governance through the everyday lives of migrant women in Johannesburg. Social Dynamics 37(3): 349-62. Kinyanjui MN. 2014. Women and the Informal Economy in Urban Africa, from the Margins to the Centre. London, Zed Books. Landau LB, Monson T. 2008. Displacement, estrangement and sovereignty: reconfiguring state power in urban South Africa. Government and Opposition 43(2): 315-336. Mauss M. 1990 . The Gift, the Form and Reason for Exchange in Archaic Societies. London, Routledge. Médard C. 2010. City planning in Nairobi, in Rodriguez-Torres D, Charton-Bigot H. (eds) Nairobi Today: The Paradox of a Fragmented City. Dar es Salaam, Mkuki na Nyota Publishers: 25-60. Mitullah W. 2010. Informal workers in Kenya and transnational organizing, in Lindell I. (ed) Africa’s Informal Workers: Collective Agency, Alliances and Transnational Organizing in Urban Africa. London, Zed Books: 184-201. Myers G. 2015. A world-class city-region? Envisioning the Nairobi of 2030. American Behavioral Scientist 59(3): 328-46. Nairobi Municipality. 1942. The Nairobi Municipality (Hawkers) (Amendment) By-laws, 1942 (available at Kenya National Archives, file number RN/8/4). Roitman J. 2004. Productivity in the margins: the reconstitution of state power in the Chad Basin, in Das V, Poole D. (eds) Anthropology in the Margins of the State. Oxford, James Currey: 191-224. Weiner AB. 1992. Inalienable Possessions, the Paradox of Keeping-While-Giving. Berkeley: University of California Press. Brigitte Dragsted-Mutengwa is a PhD student at the Department of Culture and Global Studies at Aalborg University, Denmark. She works for DIGNITY – Danish Institute against Torture. Her PhD research focuses on street traders in central Nairobi and their relationships with local authorities, exploring questions of exchange, value transformations and violence. Email: mutengwa@cgs.aau.dk.